If you have been following my training lately you would more inclined to say that I need to be committed for registering to run the Publix Georgia Marathon, rather than that I have committed to run the Publix Georgia Marathon. The Publix Georgia Marathon, previously known as the ING Georgia Marathon, will be running through the streets of Atlanta and surrounding area on March 20th, 2011. If I am doing my math correctly that is just 46 days away from today. I am feverishly looking for a full marathon training plan, including a full taper (gotta have it!) that can be completed in 45 days (I am thinking about taking tomorrow off) so if you can help me with that it would be greatly appreciated! In all honesty I have already started my training, and have been committed to run this marathon for longer than just this past week. I have run two previous marathons (#1, #2), both of which were at least a couple hour drive from home, so the possibility of running one closer to home is a welcome change. I was wanting to run a bit bigger marathon, and also was wanting to run a spring marathon. Both of my previous marathons were smaller fields, and were run in November. For this reason I was very excited that the Publix Georgia Marathon gave me the opportunity to run in the 5th running of their marathon. My training for this marathon is not where I would like it to be yet, but I am slowly getting there. I have trouble getting laser focused on my training before I register for an event, but now that I have officially registered I can see my training already getting more focused. I have heard from some friends that have run this course in previous years that it is a challenging course. For that reason, and the fact that my training is not up to where it should be yet, I am not sure what kind of goals I will be setting for this 26.2 Quest, however those will be formulated and divulged in the next couple weeks. I will be talking much more about this as the race day approaches, but for now I just wanted to get this out there and commit officially so you all can start holding me accountable with my training. 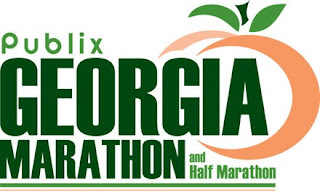 Are you running the Publix Georgia Marathon or Half Marathon? If not, have you committed to your next race? If so, which one is it? Good luck to you! I hope you have a great training period! I'm doing the half this year. I've run the ING/Publix every year since it's inception and this year I qualify for "streaker" status...they say I'll get a different shirt and bib...should be interesting. It's a great course and there's a lot of neighborhood support, you're going to have a blast! Good luck with your training, March 20th will be here before you know it! Congrats to you with the streaker status Sisyphus, that is awesome! Someone on DailyMile said that they had changed the course, have you heard anything about that? I've done the half there the past three years - one of my absolute favorite races! I've alwasy used that race as a prep for an April marathon and it bodes well with the plan AND to visit friends. But not in the cards this year. I will greatly miss it. Lots of hills, so do some hill work :). Thanks Jill, sorry you won't be able to make it this year. Almost every run has hills around here :) but I will be doing some hill work as I did for my last marathon. I am so sorry! I had trouble finding it too, and ended up finding it at Wal-mart. Funny thing is I still didn't see it at Wal-mart and then all of a sudden I saw one bottle of it. It wasn't where it was supposed to be because there was no others around. My guess is that it was stocked in a different area than the laundry detergent area. One of these day, one of these days I am going to run that marathon. I love the Atlanta area. Good luck with the marathon Tim! I've run two marathons at home and one out of town. Running one at home has some definite advantages - being able to sleep in your own bed, family and friends along the course and at the finish etc. I also find that committing to a race helps me focus more on my training. I'm a fan of the 100 Day Marathon Plan, but you are a little bit past 100 days out. It can be customized a bit, but it isn't made for a race coming up so soon! It's an 18 week plan, perhaps follow the training every 3rd week? (Do week 1, 4, 7, etc..) Also this race has lots of rolling hills so get some hill work in too. Good luck!!! Dave, Thanks for stopping by! I will have to look at it for a future one. David, Impressive on the 12/12, good luck in the Publix Georgia Marathon! I have used Hal Higdon plans for my first two marathons (Intermediate 2 for first marathon, and Advanced 1 for my second marathon) and I really like his approach. I could pick up the Novice right where it is right now, because that is right where I am currently with my training anyway. I am fairly confident that I am going to not try to PR or even push this marathon because of where I am training wise. I am probably just going to go run it to enjoy/complete it. That being the case I would be fine with just following the Novice plan (with a little hill work added) and be OK. Thanks for your comment, and enjoy #6!